Is this the worst tube station entrance in London? It might also be the best. 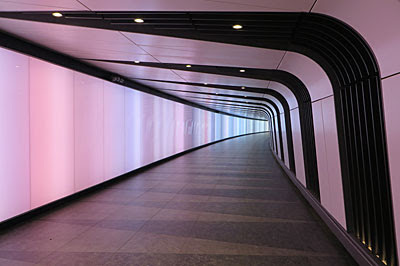 Head down these escalators, opened last summer near Pancras Square, and you enter a curving subway with a lightwall running alongside. This is an artwork called 'Pipette', a ninety-metre sweep of softly pulsing stripes that's ridiculously photogenic. It's hard to walk through without whipping out your camera, made easier by the fact that this is a particularly underused passage, so you don't get too many pesky silhouettes to wreck a perfect view. It'll be busier here one day, once all the office blocks above are fitted out, but for now the inaugural lightshow plays itself out in muted glory. But what's bad about this entrance is how ridiculously far from the platforms it is. Normally when you see a roundel in the street you know a station's not far away, but this one's been installed much further up the road than usual. King's Cross St Pancras underground station exists in linear form close to the Euston Road, but as the heart of the two mainline stations has shifted north, so a web of lengthy passages has developed to feed passengers from one to the other. The Pancras Square subway stretches this credulity even further, its portal two football-pitches-worth away from the original entrance Metropolitan Railway platforms. You can see why they've opened it, because the ability to say "close to tube station entrance" provides a not inconsiderable boost to local property values. But anyone lured in by the roundel along Kings Boulevard will find themselves embarking on a subterranean hike of unexpected proportions, because this is barely a station 'entrance' at all. I though I'd get my stopwatch out and check the timings from the Pancras Square entrance to a couple of different tube platforms. And blimey it's a long way. 0m 00s Approach escalators and head down into the subway. Woo at the lightwall, woo. 1m 50s Reach the end of the subway and turn left into the main passage from St Pancras to King's Cross. 2m 30s Reach the ticket barriers in the Northern Ticket Hall. For the H&C we're carrying on. 3m 10s Enter the next long, straight, grey passageway, past WH Smiths and a coffee cart. 4m 10s Pass the ticket barriers in the original ticket hall, before turning right towards St Pancras. 5m 30s Reach the H&C ticket barriers - this the first time you've needed to use your Oyster. 6m 20s Having descended to platform level, step through to the platforms themselves and board train. 2m 30s Reach the ticket barriers in the Northern Ticket Hall. For the Victoria, we're heading through and down. 3m 10s At the bottom of the escalators, turn left along a deep, long, grey (and busy) passageway. 4m 10s To your left is the turnoff for the Piccadilly line, but we're not going that way. 5m 25s Eventually the long grey passageway ends, so turn right down the last set of steps. 5m 40s Having descended to platform level, enter the Victoria line platform and await train. 2m 30s Reach the ticket barriers in the Northern Ticket Hall. For the Northern, we're heading through and down. 3m 15s At the bottom of the escalators, continue along a twisty grey passageway. 4m 40s Descend steps to platform level, enter the Northern line platform and await train. I should point out that pedestrians on Kings Boulevard aren't having to walk further than before to catch to a train, they're merely doing a lot more of that walk underground. 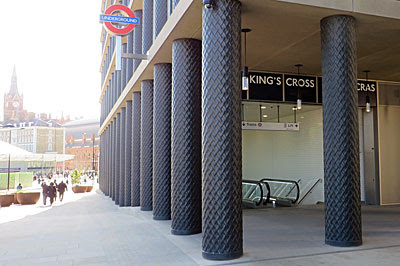 I should also say that King's Cross was already a desperately far-flung tube station before this new entrance opened, with some of the directional signs below ground notorious for deliberately sending passengers via a much longer route than necessary. But this new northern entrance stretches credulity even further, to the extent where one has to wonder precisely what constitutes a station entrance any more. So I wondered, is this the most distant tube station entrance in London, or is there somewhere requiring an even longer walk to catch a train? 0m 00s Enter staircase on the far side of the Science Museum, avoiding families and Brownies. 0m 20s Head off down the very long Exhibition Road subway, avoiding pushchairs and tourists. 4m 30s Having passed entrances for all the other museums, finally reach ticket hall. 4m 40s If ticket hall is packed with families, Brownies, pushchairs and tourists, add another minute here. 5m 10s Descend steps (assuming not packed, etc etc) to reach platform level, and attempt to board train.